In an unprecedented move yesterday, the Arizona Corporation Commission voted 3-2 against the 2017 long-term investment plans proposed by Arizona Public Service Corporation and Tucson Electric Power. The commissioners criticized the plans for relying too much on new gas-burning power plants and not enough on renewable energy. An Arizona Public Service (APS) integrated resource plan (IRP) has never been rejected before, and this is the first indication of commissioners’ preferences in a year where a Clean Energy Modernization Plan, driven by Commissioner Andy Tobin, and a state energy ballot initiative led by environmental and public health advocates are competing against each other to lay the blueprint for Arizona’s energy future. Commissioners Andy Tobin, Bob Burns, and Chairman Tom Forese voted against the utilities’ IRPs, with Commissioners Justin Olson and Boyd Dunn voting to approve them. The ACC also passed an amendment that requires specific Commission approval for any new natural gas production of 150 MW or more until January 1, 2019. Other amendments would revise the existing IRP process rules, ensure that the IRP analyze at least one option that relies less on fossil fuels, require a third-party expert to analyze future IRPs, and require future IRPs to analyze at least one option that integrates Tobin’s proposal to increase renewable energy and storage. The ACC criticized the utilities’ heavy reliance on natural gas without adequate price sensitivity analyses, and also knocked APS for inflating its forecasts for how much electricity Arizona will need. APS’ IRP as proposed requires virtually zero (16 MW in 2027) of its new electric generation to come from solar and wind, compared with 5,516 MW of new natural gas. Commenters highlighted that customers overwhelmingly support renewable energy, and that the proposed IRP does not reflect that. Advocates also contended that APS wildly missed the mark with its unsubstantiated high cost estimates for solar and wind energy, with APS claiming that peak wind energy would cost $165/MWh. Lazard has pinned wind costs at closer to $30-60 in an oft-cited study, and actual prices have come in even lower. Commenters asking for more renewable energy in the IRP process included a wide array of stakeholders ranging from top corporate players like Amazon, Apple, Facebook, Google, Ingersoll Rand, Microsoft, Salesforce, Target and Walmart to indigenous community groups. About twenty other groups have expressed interest in supporting renewable energy through an alternative portfolio. Those claims don’t jive with remarks by APS’ spokespeople in its fight to kill the proposed renewable energy ballot initiative, who have claimed that the increased renewable energy initiative would be bad for business. Why did three Commissioners Bob Burns, Andy Tobin and Tom Forese vote against this IRP in a historically unprecedented move? Although Tobin has left himself open to concerns about potential conflicts of interest in the past, his vote against the IRP is consistent with his claims that APS is over-reliant on gas. APS’ 2017 IRP bears no resemblance to Tobin’s Clean Energy Modernization Plan, which includes a 80% clean energy goal by 2050, with nuclear a part of the “clean” mix. Forese’s vote is more of a mystery. He has been a reliable vote for APS on most issues, including its recent efforts to make rooftop solar less attractive and to raise rates on all customers. Forese was one of two ACC commissioners who received over $3 million in support from dark money groups during his election in 2014. APS has always been rumored to be the source of that funding, though it has never confirmed nor denied those charges. Forese is running for state treasurer in November, and his vote may be part of an effort to distance himself from attacks on his independence. Forese was the sole commissioner to vote against the moratorium on new gas infrastructure for the remainder of 2018. As the drama unfolded at the ACC, APS was trying an end-run in the legislature to avoid having to comply with the renewable energy measure that is headed to the ballot this November. State Senator Sonny Borrelli (R – Lake Havasu City) introduced what’s known as a “striker amendment.” That amendment, if it passes, would allow APS and other utilities to simply ignore the 50% renewable energy requirement if voters pass it this November with little risk of penalty. Under current circumstances, if APS did not abide by the existing renewable energy requirements, the ACC could compel compliance. Under Borrelli’s amendment, APS would have to pay only a small fine. A spokesperson for the ACC is reported to have called the amendment illegal. APS is fighting proposed statewide vote on boosting use of renewables. Behind scenes, APS gets GOP bill in #AZLEG to weaken penalties for ignoring voters. Borrelli has been the recipient of significant largesse from APS throughout his career. 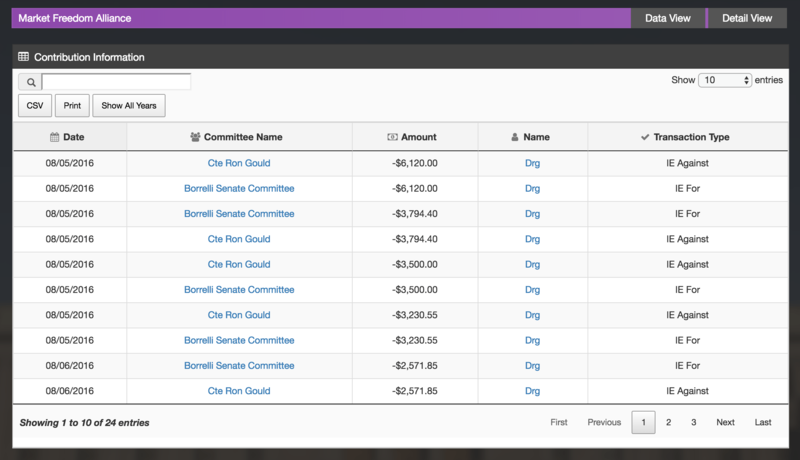 Pinnacle West, APS’ parent company, is the top lifetime contributor to Borrelli’s campaigns, according to the National Institute of Money In State Politics, which tracks campaign finance data from state governments. The second-highest donor has been the Arizona Chamber of Commerce and Industry, a close ally of APS with multiple utility executives on its board of directors. In 2016, Pinnacle West contributed $4.1 million to a group called the Market Freedom Alliance. It’s unclear how Market Freedom Alliance spent most of that money, or if it has. But the group did spend at least $100,000 in 2016 on one race, according to AZ Secretary of State data: the money went to Borrelli, and against his opponent. Borrelli’s amendment is slated for consideration by a Senate Committee today. UPDATE (4:36 pm, 3/14): The APS-backed amendment passed out of the Government committee by a 4-3 margin on the afternoon of March 14, with Republicans voting for it and Democrats against it on party lines.